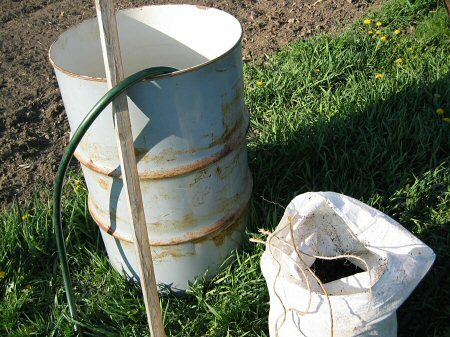 Here’s something easy that could come as a kit: a compost tea maker. One 55-gallon barrel, one strong, porous bag (this one’s a woven plastic grain sack) full of compost, some heavy twine, a strong stick, and water. Tie the sack to the stick, place the stick across the top of the barrel so that the sack is suspended, and add water. In a couple of days, a natural, healthy snack for selected seedlings. Apply by watering can. Which selected seedlings would receive such a treat?